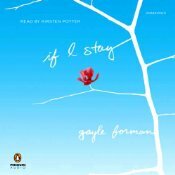 If I Stay by Gayle Forman, read by Kirsten Potter. Grades 8+. Penguin Audiobooks, 2009. 5 hours and 2 minutes. Reviewed from library copy. And Mia's parents are dead. And Mia's somehow still there, but not exactly there. She can see herself laying in the hospital bed and she has a decision to make: will she stay? How can she bear life without her family? But how can she leave her friends and her music and her boyfriend who is begging her to stay? I read this book almost two years ago for the 48-Hour Book Challenge and that was a mistake. Oh, I liked it well enough, but reading it for the challenge could not do this story justice. And now that I've listened to it, I think that the audiobook might be the perfect way to experience this book. I chuckled when I read that I "teared up" more than a handful of times on my first reading of this book. Listening to this book, I found myself with tears streaming down my face at many different points (um, not the best when you're headed in to work and have to look presentable!). Part of that was that I was revisiting the story and knowing what was going to happen allowed me to concentrate on the details I may have missed the first time around. Another part of that was definitely the narration. Kirsten Potter's simple and nuanced narration forces the listener to slow down, to absorb the full impact of every word. She varies her voice to bring out the full emotion captured in the pages. And that made for an intensely moving audiobook experience. The book's told in first person with Mia alternating between her present experience in the hospital and her memories, giving the reader glimpses into her life before the accident. The first-person narration lends itself to the audiobook format, giving the reading an intimacy as if Mia was actually speaking to you. I listened to this book in preparation for the upcoming sequel, Where She Went (April 2011), which is set three years after the accident and narrated by Mia's boyfriend Adam. Stay tuned - my review of Where She Went is coming tomorrow! If I Stay is on shelves now. Hey, I'm an Audible affiliate, so if you purchase items after clicking the links on my site, I get a small commission!